The building site is ideal for showing just who is doing the construction work. 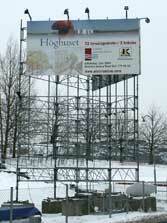 With +8 you can design your own advertising place to suit you. There are six standard solutions to choose from. If none of these meets your needs we can design and calculate a +8 Signboard according to your wishes. The system is adaptable to all sizes and types of signs. The +8 Signboard foundation does not need to be cast in concrete. The +8 Signboard is wind-load calculated. The surface does not normally need to be prepared; the concrete weights can stand on uneven ground as the base jack is adjustable in all directions. Two people can easily assemble and dismantle the +8 Signboard. Once the construction work is completed, the +8 Signboard is simply packed up and transported to the next site. There it is re-erected, in the way that best suits the new building site. This is possible as all +8 Signboards are built with the same standard components irrespective of the size.